If the men with machetes had had their way, Tharcisse Seminega and Charles Rutaganira would be long gone. Instead, 25 years after they faced almost certain death, both men are still alive. 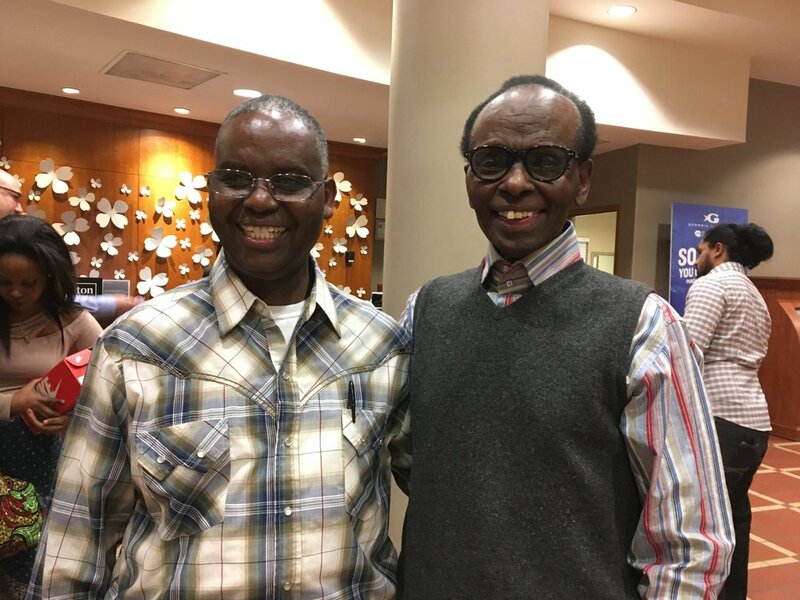 They were reunited in Atlanta this week to speak at the National Center of Civil and Human Rights on a program marking the 25th anniversary of the genocide against the Tutsi in Rwanda. The two men, who haven’t seen each other since their days together as refugees in Uganda, joined their wives in relating their stories of survival. On April 7, 1994, an estimated 800,000 people in Rwanda perished in one of the fastest-moving genocides in modern history. The Tutsi ethnic group faced a plan for total extermination by the extremist Hutu regime. Sympathetic Hutu who opposed the slaughter or tried to save doomed Tutsi also met death. That reality made survival even more unlikely. Mr. Rutaganira recounted how soldiers led a mob of 30 Hutu to his house, telling the mob to “Finish him off.” The mob included some of his Hutu friends and neighbors. “We had no problems before,” he said. “But that day, they came with hatred in their eyes.” Armed with machetes, spears, and clubs, they slashed him all over his body and left him for dead on the street in front of his house. Mr. Seminega was a professor at the National University of Rwanda (NUR) when the genocide erupted. Extremist Hutu faculty helped gather lists of Tutsi faculty marked for a cruel death. Mr. Seminega, his wife, and their five children repeatedly evaded the killers during 75 terrifying days. Contact: To arrange interviews with Tharcisse Seminega and Charles Rutaganira, contact Sandra Milakovich, U.S. representative for the Arnold-Liebster Foundation, (563) 391-1819, Ext. 2.
machetes, hoes, nail-studded clubs—and lists of those doomed to die. humanity’s most horrific self-inflicted tragedies. describes Rwandan society’s headlong descent into mindless genocide. become a priest. He later felt drawn to the faith of Jehovah’s Witnesses and their strictly apolitical, nonviolent ethic. In 2003, Tharcisse and Chantal moved to Canada with four of their five children. The Laura and Lorenz Reibling Family Foundation is supporting KarmaFlights' 2018 Winter Clothing Drive for Nepal. The organization is again helping kids in Nepal to stay warm and healthy during the winter. Many impoverished families have to face their third winter living in temporary shelters; lacking funds to rebuild their homes post-earthquake. Particularly at risk are the very young and very old. KarmaFlights is collecting winter clothing and accepts donations to buy new warm children's clothing. They will cover 14 schools in the Himalayan Manaslu region. Please consider donating. The bi-annual symposium held in connection to Prof. Reibling's Holocaust courses at Boston College turned out to be an important historical lesson about not only the Japanese American Exclusion and Resettlement in the USA, but also the persecution of Jehovah's Witnesses in Japan during WWII. The patterns discovered during the speakers keynotes made clear: Although the magnitude of devastation of the Holocaust in Germany encompassed and the effects on the lives of Jews and JW's were different - the underlying principles of racism and nationalism, riding along with intolerance and bigotry, were very similar around the world and deserve more research. Prof. Glenn Mitoma, Prof. John Michalczyk and Prof. Lorenz Reibling's historical explanations were met by impressive questions of the auditorium and contributed to a successful evening at Devlin Hall. The European Commission has published two guides on Patient Blood Management (PBM). PBM is a patient-focused, evidence-based and systematic approach to improve patient outcomes through the safe and rational use of blood and blood products and avoiding unnecessary transfusions. The PBM approach has been endorsed and promoted by the World Health Organization and is widely accepted as current best practice. The Laura and Lorenz Reibling Family Foundation is an active supporter of PBM research and welcomes the publication of the guides, hoping they will support the efforts of health authorities in the EU and improve the treatment of many patients in the future. Building on numerous awards in the USA, Europa and Russia, the documentary about 107-year-old Nazi concentration camp survivor Leopold Engleitner has now received recognition in India as well. Among 500 film submissions from nearly 50 countries "LADDDER in the LIONS' DEN" received an "Official Selection" by India's "GardenCity International Film Festival". The festival will take place in the north-eastern part of India in the IT capital Bangalore in April. A night to remember for a long time: Lorenz and Laura Reibling had the pleasure to attend The Lexington Symphony concert "Discover new Worlds" alongside the German Consul General Dr. Ralf Horlemann and his lovely wife, many friends and the composer Baris Perker with his parents (that flew in from Turkey) this past Saturday night at Lexington’s newly renovated Cary Concert Hall. The event, was attended by over 400 guests (undeterred by a late NE snow-event) and met with standing ovations. Sponsored by the Laura and Lorenz Reibling Family Foundation, Discover New Worlds featured music by composers Jean Sibelius, Baris Perker and Antonin Dvorak. Baris, a close friend of the Reibling family, was raised in Istanbul, Turkey. His music is evocative and picturesque. He began his piano studies at the age of 8, going on to win many awards in his career. 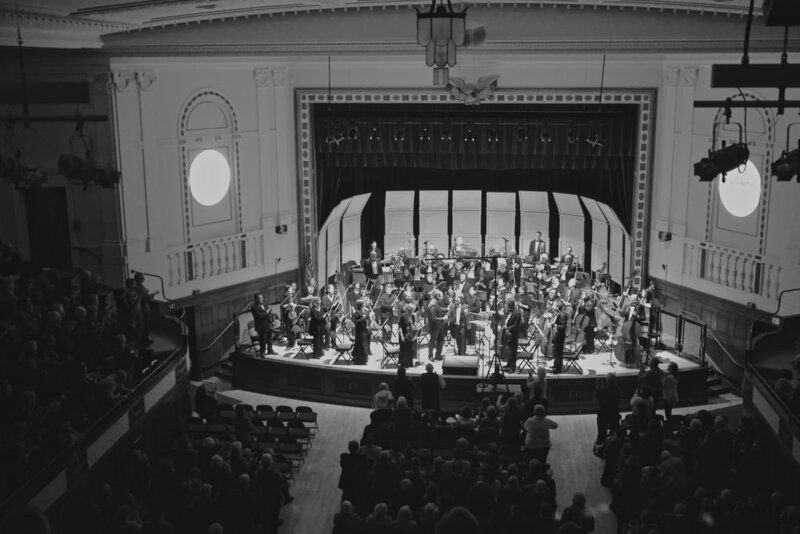 He received degrees in both piano and composition at Peabody conservatory. He has since earned his master’s and Doctor of Musical Arts degrees and now resides in Cambridge, MA. 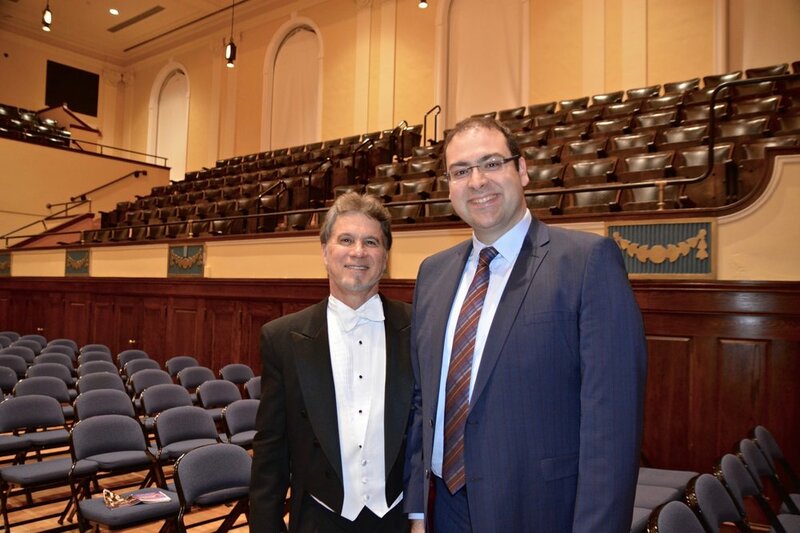 Click here to learn more about Baris Perker’s music. KarmaFlights is helping kids in Nepal to stay warm and healthy during the winter. The situation is particularly desperate this year. Many impoverished families have to face their second winter living in temporary shelters; lacking funds to rebuild their homes post-earthquake. Particularly at risk are the very young and very old. KarmaFlights is collecting winter clothing and accepts donations to buy new warm children's clothing. Please consider donating. Nachrichten.at tells the story of how Bernhard Rammerstorfer became a holocaust filmmaker by meeting Leopold Engleitner, a holocaust survivor whose life story later reached millions with the award winning documentaries "Ladder in the Lion's Den" and "Taking The Stand". July/October 2016 - The Long Island International Film Expo 2016 has awarded the Alan Fortunoff Humanitarian Film Award to Austrian filmmaker and author Bernhard Rammerstorfer and his Holocaust documentary Taking The Stand. The New York film festival, rated as one of the Top 25 Coolest Film Festivals in the World by MovieMaker Magazine, honored the documentary with another nomination in the category “Best Documentary". In addition, the film won Best Short Documentary Film Award at the Laughlin International Film Festival 2016 in Nevada. In concert with an unusual panel of victims of Nazi tyranny, author and producer Bernhard Rammerstorfer rekindles the memories that illuminate powerful gem-stories of Holocaust survivors in "TAKING THE STAND. Shedding light on the ability of the human spirit to survive, recover and even triumph in the face of repression, aggression, loss, and every attempt to destroy it or break its will, he conducted one-on-one interviews with nine individuals with widely differing experiences, using a set of 100 questions from students all over the world. Beside TAKING THE STAND, Rammerstofer is the producer of the award-winning documentary LADDER in the LIONS' DEN about Leopold Engleitner, who was with 107 the world's oldest known male Nazi concentration camp survivor, which received 15 awards and honors in the US and internationally. His meticulous pursuit of historical accuracy has earned the respect of fellow researchers and historians. With several film festival awards, and the acclaim of more than 2,000 news articles, online media, TV and radio stations around the globe, the public has rendered homage to his relentlessly passionate drive to be the calm, ordinary, yet powerful voice of those of underserved persecution.